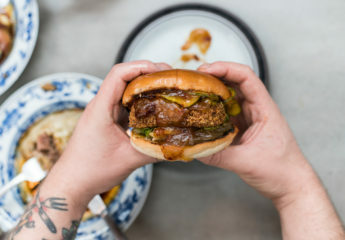 Pizarro is exactly the sort of place you wish you had in your neighbourhood, nestled away as your little secret, with a table on hold for whenever you want to drop in. 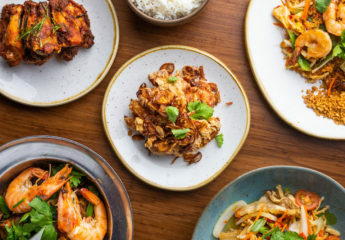 Pizarro is exactly the sort of place you wish was in your neighbourhood, nestled away as your little secret, with a table on hold for whenever you want to drop in. 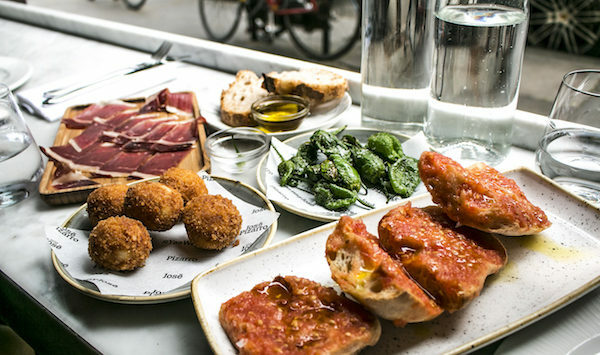 However, this buzzing Spanish restaurant from king of Spanish food in London, José Pizarro, is rather well-known, and as a result you’ll have to jostle for a seat most evenings. It’s situated on Bermondsey Street, which also houses José’s more informal tapas place, but it’s Pizarro that has our heart. 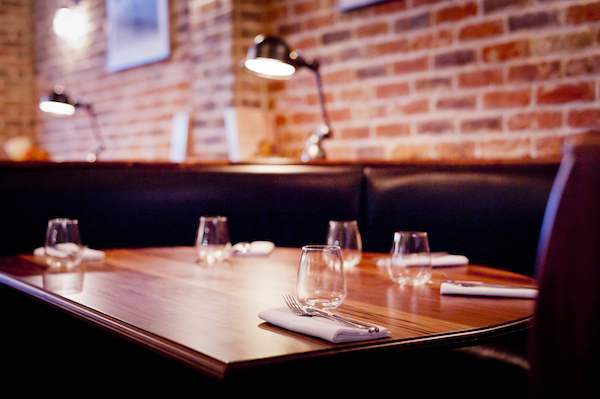 The small restaurant offers booths, bar dining, regular tables and window seats, and we settled in on a couple of comfy bar stools overlooking the kitchen for an evening admiring the handsome brigade of chefs, and the dishes they produced. Staff are smart, engaging, and happy to share their knowledge of regional Spanish cuisine and wine matching from the unpretentious menu. Guiding us straight to the gin and tonic list was a nice touch, and the pomegranate-laced drinks instantly evoked memories of lazy afternoons spent in the Spanish sun. The focus here is on top-quality Spanish produce, and the leg of acorn-fed Jamon Iberica that sits on the bar is where all good meals should start. The team at Pizarro could hypnotise with their slicing skills, and it’s virtually impossible to stop at just one plate of the luscious ruby-red ham that’s rippled with just the right amount of fat. 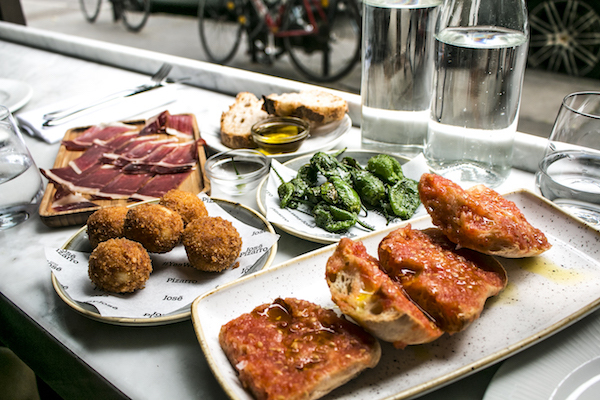 The small plates (Pica Pica) feel very familiar and focus on traditional Spanish cuisine such as pan con tomate, croquetas, and pulpo. 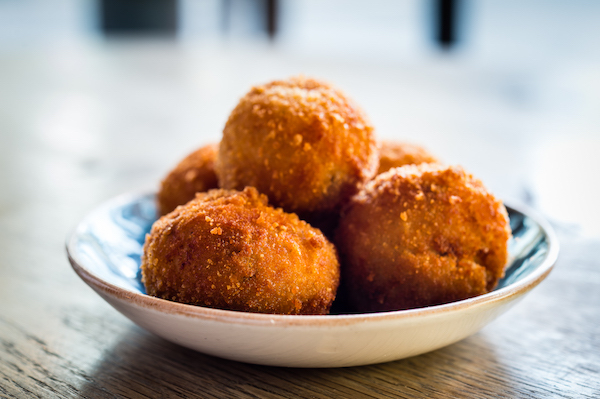 If croquetas are a benchmark of the quality of a restaurant then this is a very good restaurant indeed – spinach and béchamel encased in the lightest of batter make for a delicious, salty snack to accompany a cool, crisp glass of Cava. The Presa Ibérica at Pizarro is one of London’s top cuts of pork and absolutely outstanding. Served simply with padron peppers and crispy potatoes it’s as understated as they come, enabling the unique flavour of this prized cut to really shine though and it packs a seriously porky punch. We couldn’t leave without trying a dessert of canellas of sweetened milk with pine nut ice cream which was devoured by my guest, but a little sweet to my taste. Pizarro is an excellent restaurant that goes above and beyond to source great produce and provide warm and intelligent service, which is why it remains a firm favourite in London’s crowded Spanish dining scene. 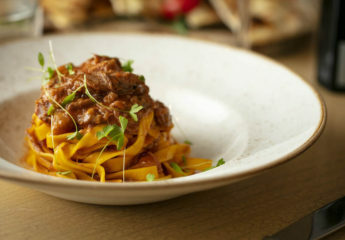 If you enjoyed this review of Pizarro, read some of our other latest reviews including Harry’s Dolce Vita, Jean Georges at the Connaught and Ella Canta.